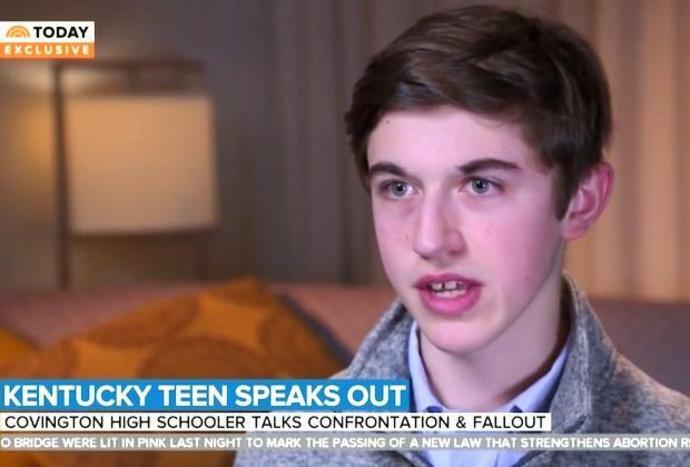 Covington Catholic High School student Nicholas Sandmann did not taunt Native American activist Nathan Phillips, the teenager said during a Wednesday morning interview on NBC's Today. Sandmann, who was not identified by name until Sunday, made headlines over the long holiday weekend as the face of the Covington Catholic High School student group that was in Washington, D.C. on Friday for a March for Life event. Based on a first, brief video that went viral on Saturday, it appeared that the Covington students - many of whom were clad in "Make America Great Again" gear - and Sandmann in particular were mocking Phillips, the Native American activist and elder, as he banged a drum and sang in front of the prep schoolers outside the Lincoln Memorial. A longer video that surfaced on Saturday afternoon, however, revealed that prior to encountering Phillips, the Covington students were being verbally harassed by the Black Hebrew Israelites religious organization. Phillips (who was in Washington for the Indigenous Peoples March) then stepped between the two groups and faced Sandmann & Co. as he sang a song of unity, hoping to temper tensions. "I never interacted with this protestor," Sandmann said in a three-page statement released on Sunday, which was shaped by a Louisville-based public relations firm. "I did not speak to him. I did not make any hand gestures or other aggressive moves. To be honest, I was startled and confused as to why he had approached me… At that moment, I thought I had diffused the situation by remaining calm, and I was thankful nothing physical had occurred." Speaking to Today's Savannah Guthrie, Sandmann maintained that he had every right to stand there when Phillips approached him. "My position is that I was not disrespectful to Mr. Phillips," he said. "I respect him; I'd like to talk to him. In hindsight, I wish we could have walked away and avoided the whole thing, but I can't say that I'm sorry for listening to him and standing there." As for the smirk that many have construed as taunting Phillips, Sandmann argued that it was just a smile. "I see it as a smile saying that this is the best you're going to get out of me. You won't get any further reaction of aggression, and I'm willing to stand here as long as you want to hit this drum in my face," Sandmann said. "People have judged me based off one expression… I wasn't smirking but people have assumed that's what [I did], and they've gone from there to titling me and labeling me as a racist person, someone that's disrespectful to adults… They've had to assume so many things to get there without consulting anyone that can give them the opposite story." Meanwhile, Sandmann alleged that he and his fellow students were egged on that day. "I'd just say that the fact remains that they initiated their comments with us," he said, referring to the Black Hebrew Israelites. "They provoked us into a peaceful response of school spirit." Watch additional excerpts from the interview below, then check back shortly for the full video.